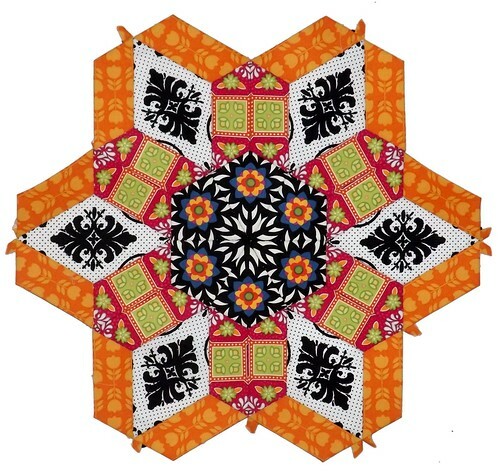 Round 1 of Rosette 1 for the The New Hexagon Millefiore 2015 QAL has been completed! If you’d like to know what fabrics I’ve used thus far, check out this post. Be warned, most of these fabrics are likely out of print. They’ve just found new life through this project. It’s not as precise as I’d like in some spots… However, I’m accepting those small ‘flaws’ as part of the process. EPP is something I’d only barely flirted with before, and actually hated. But then, I was using the June Tailor Simple Shapes hexagon templates to do it. I found the plastic templates too thick, and when I whip-stitched hexies together, I was disappointed by how visible the stitches were. Also, I found thread basting all of these pieces to be tedious. Now that I’ve changed up my methodology, I can see myself doing EPP far more often. Instead of plastic, I’m using cardstock. I’m also glue basting all my pieces, and using ladder stitch to join everything. I’m finding all of these changes make piecing these hexagons much faster. More importantly (to me), they’re much neater looking. I can’t see my stitches. I’ve picked out fabrics for the Debbie blocks in Round 2, and prepped those pieces. I selected the bird fabric in order to reintroduce blue to the rosette, based on the center hexagon, which is the same reason I selected the yellow print. 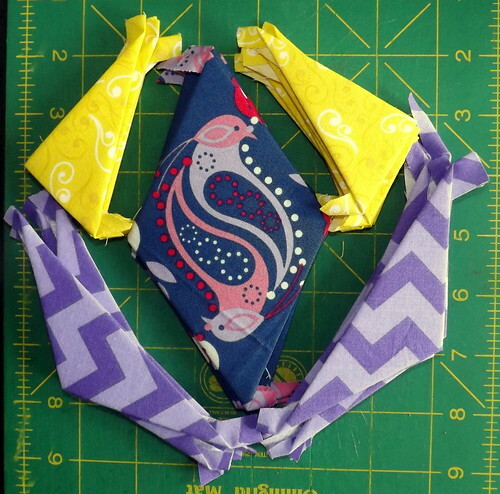 The purple print chevron print seemed like a natural addition, based on the bird fabric. I have a coordinating print for the bird fabric that might be introduced in the other half of round two… I’m not sure yet. I need to audition fabrics, but don’t want to do so until I have one of these block pieced. I’m finding I’m having some trouble with visualizing the final hexagons – this method of constructing a block is just a little too new to me.